Simpson's Tractor Inc. has been proudly serving Richland Center and the surrounding area since 1920. 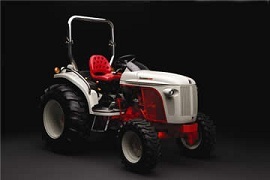 We offer high quality new and used agricultural and industrial equipment for sale, as well as a service center for the repair of tractors and other farm machinery. Simpson's Tractor Inc. invites everyone to visit the Richland Center Rotary Lights in the Park. This event opens November 21, and runs all the way through to December 31. Join the festivities, and enjoy LED displays, including that on the MEGA TREE! For more information, visit the Rotary Lights in the Park Facebook page. This is a listing of the tractors we currently have for sale. For more information, including prices, please give us a call at 608-647-6343 during normal business hours (7:30 AM - 5:00 PM). You can also email us at simpford@mwt.net - be sure to mention the specific piece of equipment you are interested in. Simpson's Tractor Inc is proud to have been serving the Richland County area since 1920. In that time, both the community we work in and the farm equipment we sell and service have gone through many changes, but we have always maintained our dedication to quality parts and workmanship. We are located on Highway 14 in Richland Center, Wisconsin. The House on the Rock The House on the Rock is an architectural wonder located amid Wisconsin's tranquil forests. The House was the incredible vision of one man. Frank Lloyd Wright's Taliesin Frank Lloyd Wright is remembered as one of the nation's greatest architects. His work can be seen in several locations around the state. Motels and Hotels in Richland Center, WI Provides a listing of Motels and Hotels available in the general area. mwt.net MWT.net - providing internet access to the local community and beyond. Things to do in Richland County Provided by the Richland County Chamber of Commerce. Copyright © Simpson's Tractor Inc.. All Rights Reserved.